The IFRS for SMEs was developed to address the reporting needs of SMEs worldwide. SMEs however do not necessarily have a global focus. Furthermore, SMEs from different parts of the world are exposed to different conditions and environments. Although the IFRS for SMEs was not intended for a specific user group, the majority of the respondents to the Exposure Draft on IFRS for SMEs were from Europe and other developed countries while only limited respondents from Africa and developing countries were involved. Keywords: accounting, generally accepted accounting practice, international financial reporting standards, small and medium entities. Proper and relevant disclosure of financial information has been called for by a number of observers in recent times. According to Wömpener and Köhrmann (2006:2) appropriate reporting of financial measures not only facilitates company performance appraisal, but also enhances transparency. In addition, the adoption of International Financial Reporting Standards (IFRS) is intended to facilitate cross-border investments and access to global capital markets (AICPA, 2008:2). Since many public companies are required to apply IFRS for stock-exchange listing purposes, the adoption of IFRS became a necessity for international business. As a result IFRS was adopted by many listed companies in Europe and elsewhere (ICAS, 2008:1). A different scenario, however, prevails at non-listed and/or small and medium entities (SMEs). Dixon, Thompson and McAllister (2002:27) argued that matters pertaining to large firms are not necessarily applicable to SMEs. In 1995 the American Institute of Certified Public Accountants (AICPA) rated certain generally accepted accounting principles (GAAP) requirements, from the perspective of SMEs, as low on decision, relevance and usefulness (Zanzig & Flesher, 2006:4). In addition, the emphasis on global financial reporting standards due to international harmonisation and business might not be a priority for SMEs because only a small percentage of the SME sector has a global focus. Van Mourik (2007:193) concluded that globalisation and inter-nationalisation are products of multinational companies. According to the Organisation for Economic Co-operation and Development (OECD) approximately one per cent of SMEs can be considered global. SMEs' involvement in globalisation is often limited to those that engage in some form of exporting to economies that are geographically close to each other and culturally similar (OECD, 1997:89). It is therefore suggested that the accounting and related disclosure functions of SMEs are limited to transactions encountered by SMEs in individual countries. Nonetheless, the International Accounting Standards Board (IASB) developed a global accounting standard for use by the SME sector. In developing the IFRS for SMEs, one of the objectives was to develop, in the public interest, a single set of high quality, understandable and enforceable global accounting set of standards for the SME sector. The IASB (2007:11) was committed to take into account the special needs of SMEs, and in deciding the content of the proposed IFRS for SMEs, the IASB focused on the types of transactions and other events and conditions typically encountered by SMEs with approximately 50 employees (IASB, 2007:6). SMEs worldwide do however not necessarily engage in similar activities; UK SMEs are mainly involved in the agricultural, business and construction sectors; South African SMEs are prominent in community, social and personal services and the finance, real estate, wholesale and agriculture sectors; and in Kenya SMEs are mainly involved in agricultural activities (ACCA, 2000:1-4). Due to these differences it is suggested that the different conditions and transactions encountered by different countries are not conducive to a global set of accounting standards for the SME sector. Accordingly, in order to assess the relevance of the IFRS for SMEs, the contents of the proposed IFRS for SMEs should be compared to transactions and events disclosed by SMEs from different countries. The debate around Big GAAP and Small GAAP, or accounting practices pertaining to large and small entities, has been an ongoing issue since the 1800s. In 1886 the Senate Select Committee in Interstate Commerce based in the United States (US) considered the question whether corporations should be required to adopt a uniform system of accounts (Ho & Shying, 2007:1). Since then a number of commentators supported such a uniform set of accounts for reasons of comparability, while commentators opposing uniformity based their arguments on the fact that the benefits derived from information should exceed the cost of providing it. In 1995 the Private Company Financial Reporting Task Force of the AICPA concluded that the benefits for SMEs in complying with GAAP outweigh the costs (Zanzig & Flesher, 2006:4). Elsewhere, many national standard-setters have introduced differential reporting for SMEs, resulting in diverse practices by standard-setters, preparers and users of SME financial statements (Cordery & Baskerville, 2006:2). The development of a global, uniform set of financial reporting standards for SMEs commenced in 2004 when the IASB published a discussion paper on the preliminary views on financial reporting standards for SMEs. In 2007 the IASB published a document for public comment entitled "The Exposure Draft (ED) of International Financial Reporting Standard for Small and Medium-sized Entities" (IFRS for SMEs) which incorporated approximately 15 per cent of the reporting standards applicable to large and listed entities (SAICA, 2007a:2). Approximately five years after the initial discussion paper the IASB formally adopted the ED on IFRS for SMEs as an International Financial Reporting Standard (IASB, 2009a:1). The IFRS for SMEs was therefore a result ofa five-year development process during which the IASB considered 162 letters of comment on the ED (IASB, 2009b:1). In 2004 the Hong Kong Institute of Certified Public Accountants expressed their concern with the IASB's preliminary views on accounting standards for SMEs and suggested that the IASB should conduct a survey to ascertain to what extent the accounting standards for SMEs would result in compliance cost saving for SMEs (HKICPA, 2004:1). The European Accounting Association Financial Reporting Standards Committee commented that the financial reporting regulations of the IASB are influenced by the user needs of a traditionally Anglo-American corporate governance tradition, and, since the Continental model applies to most of Europe, the IFRS for SMEs will not address the reporting needs of SMEs in Europe (EAAFRSC, 2004:20; Joos & Lang, 1994; Zeghal & Mhedhbi, 2006).  The Dutch Accounting Standards Board commented that the ED did not address the needs of the users of SME financial statements. On 7 August 2007, in the midst of the aforementioned development process, South Africa became the first country in the world to formally adopt the IASB's ED on IFRS for SMEs, without any changes to the ED's original text, as the Statement of GAAP for SMEs (Carte, 2007:1). However, two months after the adoption of the ED on IFRS for SMEs the South African Institute of Chartered Accountants commented to the IASB that: i) significant simplifications are needed, ii) the scope should be more clearly defined and iii) the requirements in the proposed IFRS for SMEs are too onerous given the level of accounting knowledge of preparers and the needs of the users of the financial statements (SAICA, 2007b). The comments by the South African Institute of Chartered Accountants could be indicative of the fact that the adoption of the ED on IFRS for SMEs in the South African context was premature. The possibility that the ED on IFRS for SMEs was implemented too early in the South African context was further supported when the South African Institute of Chartered Accountants suggested, in addition to IFRS and IFRS for SMEs, a third level of reporting for non-public interest entities (SAICA, 2008:1) which resulted in the commissioning of a South African working group to draft a proposed financial reporting framework for non public entities and to address the concerns that were raised against IFRS for SMEs (Lombard, 2008:20; SAIPA, 2009:1). Although tax authorities are key recipients of SME financial statements (Sian & Roberts, 2009:302), accounting standards are, due to different tax jurisdictions worldwide, not intended to meet the reporting needs of tax authorities in different countries (IFAC, 2006:17; IASB, 2009c:20). Apart from tax authorities, the most frequent users of small company financial reports include owner-managers and providers of finance (Saracina, 2005:2). Providers of finance include banking institutions and investors while internal users of financial statements are mainly concerned with the management of businesses. According to the European Commission (2010:8) financial statements constitute only one of many factors that are considered in the credit-granting process by banking institutions. The European Commission (2010:8) concluded that the adoption of the IFRS for SMEs, if compared to prevailing national accounting practices, will not provide additional benefits to banks. Moreover, banks usually do not depend on published financial statements since they have the right or power to demand the information they require (EAAFRSC, 2008:37). While bankers require financial statements for accuracy and comparability purposes, and since investors consider trend lines and year-over-year comparisons to be important, relatively little is known about the actual views and needs of owner-managers (EAAFRSC, 2004:2). Schiebel (2008:1) concluded that the ED on IFRS for SMEs is biased towards the opinions of auditors and accountants, implying that the views of internal users of SME financial statements were not considered by the IASB. Even though Saracina (2005:2) listed owner-managers as frequent users of SME financial statements, Sian and Roberts (2009:289, 301) concluded that many SME owners have limited or no formal accounting training, they rely on external accountants to prepare their financial statements and accordingly they are often left bewildered by the complexity of the information provided. In addition, Sian and Roberts (2009:301) concluded that SME owners utilise computerised accounting programs, and not the financial statements, to interpret data for managerial purposes. The omission of the views of owner-managers, as internal users of financial statements, was also confirmed by the IASB's (2009c:20) statement that it is not the purpose of the IFRS for SMEs to provide information to owner-managers to help them make management decisions. The evidence therefore suggests that the views of internal users of SME financial statements were omitted due to no formal accounting training, as well as limited interest by this group of users due to no reliance on financial statements for managerial purposes. 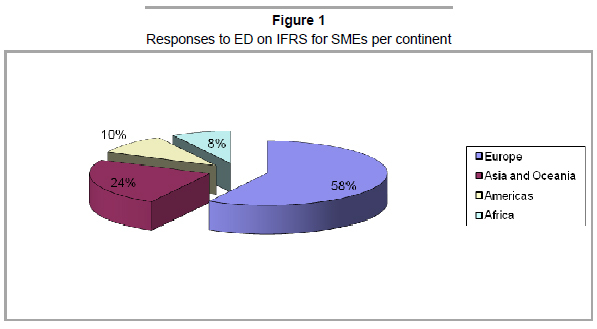 Furthermore, as far as external users are concerned, Schiebel (2007:17) reported that only eight percent of respondents to the ED on IFRS for SMEs were external users of SME financial statements. Accordingly, even though the IFRS for SMEs is intended for non-publicly accountable entities that publish general purpose financial statements for external users, the benefits of the IFRS for SMEs for the different user groups remain to be tested. In respect of global research, Schiebel (2007:17) concluded that the IASB did not conduct serious worldwide empirical analyses in deciding the contents of the ED on IFRS for SMEs. 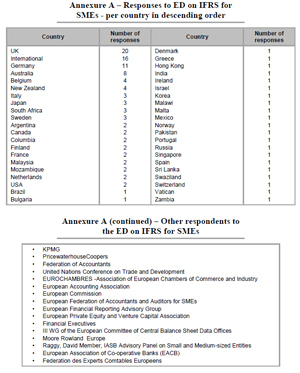 The summary of responses to the ED on IFRS for SMEs in Annexure A suggests that a substantial number of responses was received from within the UK. Furthermore, if the responses are grouped per continent it is evident that 58 per cent of the responses were from Europe alone (refer to figure 1 below). 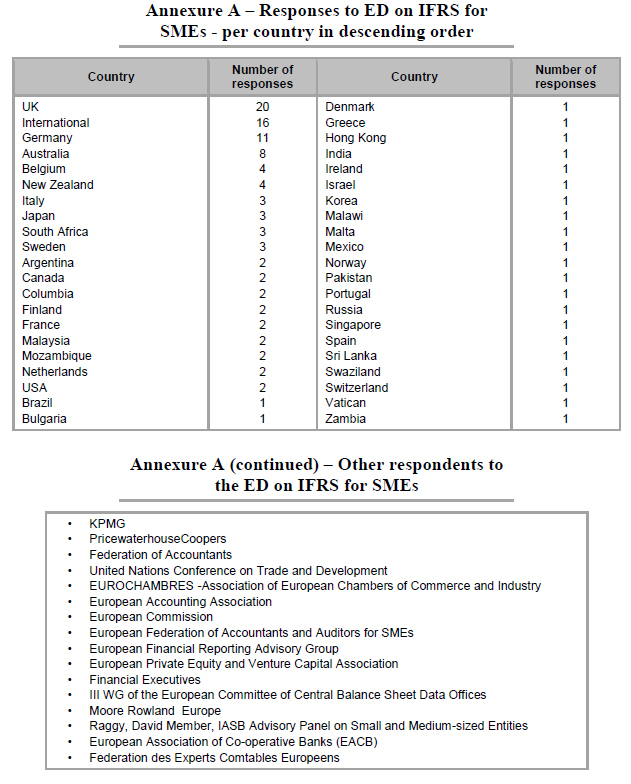 Even though the majority of the responses to the ED on IFRS for SMEs was from Europe, the process of adopting IFRS in Europe alone appears to be burdensome. According to ACCA (2004:1) individual member states of the European Union will move at different speeds to take their national standards for unlisted companies towards IFRS, resulting in a too slow convergence process for some member countries. A possible explanation for the low level of response by the Americas might be attributable to the fact that listed companies in the US are required to compile financial statements in accordance with US GAAP and not IFRS. In addition, SMEs in the US are not legally required to file statutory financial statements in accordance with GAAP or any other relevant reporting standard (Epstein & Jermakowicz, 2007:1). The continent with the lowest number of responses was Africa with eight percent of the total responses received. Compared to the continent with the highest number of responses, Europe (58 per cent), where the convergence process to IFRS was reported to be too slow, it is suggested that the process in Africa will be even more burdensome due to unique challenges such as lower levels of development. The concept of applying global reporting standards to SMEs in developing countries is believed to be more difficult than elsewhere (United Nations, 2008:2). Oberholster (1999: 232) suggested that the unique challenges and the heterogeneous nature of developing countries are not necessarily accommodated when International Accounting Standards are adopted by these countries. Simpson (2008:1) also suggested that the IASB did not take into account the uniqueness and challenges of SMEs in developing countries and advocated that the term SME in the ED on IFRS for SMEs is aligned to the US definition of an SME and therefore not necessarily relevant to developing countries. Sacho and Oberholster (2008:128-130) concluded that the implementation of IFRS is not necessarily a "one-sizefits-all" solution for the accounting needs of developing countries. They argued that developing countries do not have historically developed accounting standards and are often required by global market players to apply IFRS, which, according to them, might result in distorted and incongruous results. Although there is no uniform definition available to distinguish developing countries from developed countries, the United Nations developed the Human Development Index (HDI) to measure the level of human development for a specific country. 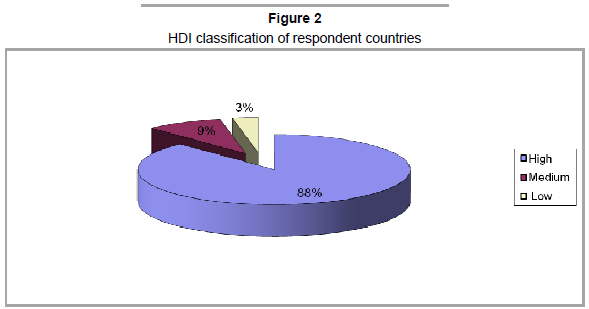 Countries with low to medium HDIs are classified by the United Nations as developing countries. If the responses to the ED on IFRS for SMEs is analysed according to the HDI of each country the number of respondents/commentators from developing countries is only 12 per cent. According to Correa-Cortes (2008:1), SMEs from developing countries find it more difficult to cope with typical SME challenges such as limited financial and human resources. Zeghal and Mhedhbi (2006:376) suggested that the decision to adopt IFRS by developing countries, in particular, is influenced by: (i) economic growth; (ii) educational levels; (iii) the degree of external economic openness; (iv) cultural considerations; and (v) the existence of capital markets. It is therefore possible that the IASB did also not incorporate the distinctive and unique SME attributes from developing countries, as opposed to SMEs from developed countries. H1: The IFRS for SMEs will not adequately address the reporting needs of South African SMEs. As a result we intend to evaluate the contents of the IFRS of SMEs against the SME reporting environment in South Africa. This comparison might be an indication of the extent to which the IFRS of SMEs is applicable and acceptable to SMEs within the South African context. The research encompassed both a literature and an empirical study. The literature review considered the unique nature of SMEs, the development of the IFRS for SMEs and the various SME role-players. Our literature review revealed that SME environments in different parts of the world are diverse, and that SMEs in different parts of the world do not always engage in similar types of activities, warranting differences in accounting practices by SMEs worldwide. Our empirical study was conducted to evaluate the contents of the IFRS for SMEs against the actual disclosure practices of SME accountants in South Africa. Our decision to include accounting practitioners was based on the findings by Sian and Roberts (2009:289) that SME owners rely on external accountants to prepare financial statements as well as the conclusion by Schiebel (2008:1) that the IASB considered opinions of mainly auditors and accountants in developing the IFRS for SMEs. We therefore suggest that, in contrast to most large and listed companies with effective inhouse accounting functions, SME accountants, as preparers of the financial statements, should be considered when evaluating accounting transactions encountered by SMEs. The views and perceptions of accounting practitioners were also considered important by Van Wyk and Rossouw (2009:102), who argued that accounting practitioners, as preparers of SME financial statements, are involved in the day-to-day transactions of smaller entities and are therefore a reliable source for their study. They also argued that users of these financial statements should not be involved due to a lack of understanding of the technical nature of the accounting principles contained in the accounting regulation. The omission of other users of SME financial statements for purposes of our empirical study was further supported by Day (1986:295), who suggested that users of financial statements do not understand the accounting processes, as well as the proposition by Schuetze (2001:2) that users of financial statements and reports have almost no grip on the rules governing financial reporting. Accordingly, in November 2008 responses were obtained from trainee accountants at a preparation course for the South African Institute of Professional Accountants (SAIPA) qualifying exam. In addition to a university qualification these participants gained three year practical experience at a SAIPA-accredited training office. Approximately one year later, in November 2009, SME accountants participated in our study at a SAIPA national accounting update seminar. Respondents from large and public entities were omitted and not considered for this study. The participants responded to the contents of the IFRS for SMEs using a five-point Likert scale (refer to Annexure F). With regard to the analysis stage, the use of Likert scales requires the use of a ranking procedure with 1 minimum and 5 maximum score. According to Annexure B and C the survey consisted of 31 trainee accountants and 126 practitioners. With regard to the unequal split between the number of trainee accountants and practitioners included in the survey, it was not our intention to compare and interpret differences in results between the two groups in detail. In addition to the fact that the survey of the trainee accountants was conducted as a pre-test for our survey of accounting practitioners, and even though this group might not have the same level of experience, we included their responses as a control group in our study. Our decision to include this group was further supported by their practical exposure to the SME accounting environment as well as the fact that they, subject to passing the qualifying exam, are entitled to practice as SME accountants. Accordingly we calculated the mean ranking by practitioners and trainee accountants pertaining to the contents of the IFRS for SMEs. In addition, for purposes of an analysis of commonality amongst the alternative sample groups, and to assess whether the means of the two groups are statistically different from each other, we performed an independent group t-test at a 95 per cent confidence level. 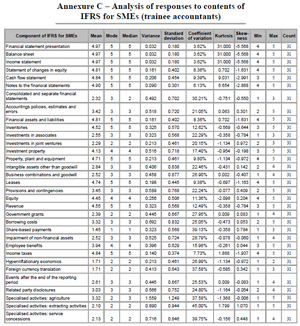 Based on the above mean ranking by practitioners and trainee accountants we arranged the contents of the IFRS for SMEs in a sequential hierarchy of importance. As a result we considered the appropriateness of the contents of the IFRS for SMEs pertaining to the South African SME environment. When the responses of the two groups were considered we noted that the mean answers in Annexure D were very similar ranging from the lowest difference of 0.047 for provisions and contingencies to an uppermost difference of 1.186 for leases. Only two components, leases and share-based payments, revealed a mean difference in excess of one ranking. The standard deviation between the mean scores of the two groups of respondents amounted to 0.554. 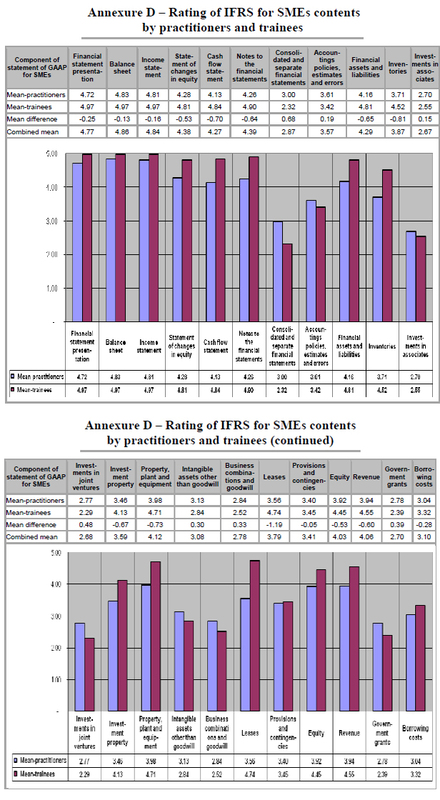 Furthermore, t-tests performed per IFRS for SME component in Annexure E revealed no significant difference, except for lease transactions, between the mean answers of the two groups. 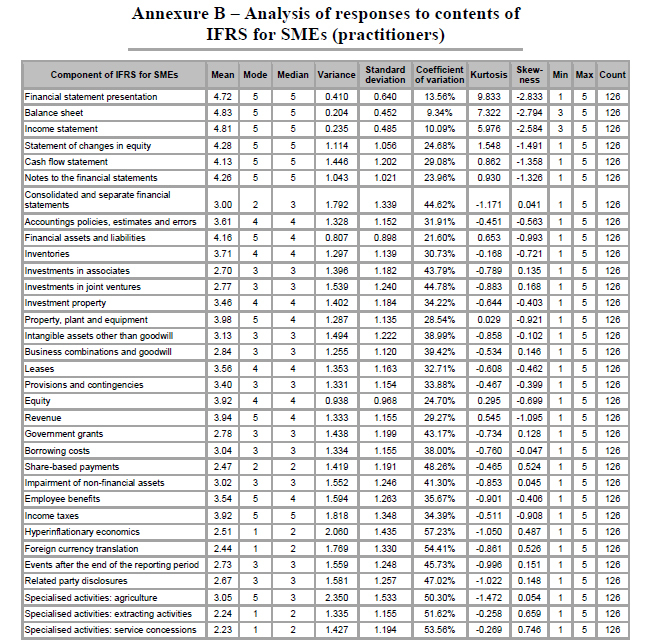 where n represents the number of answers per group and i represents the component of IFRS for SMEs. 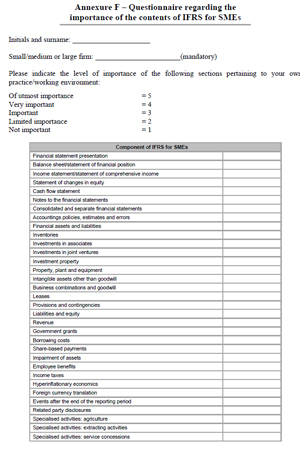 Based hereupon we ranked the contents of the IFRS for SME in sequence of importance. Firstly, from our analysis in Table 1, we noted that the general structure or format in which the financial statements should be compiled is considered necessary and essential as the mean ranking was between very important and of utmost importance. We noted that the statement of changes in equity (4.382) and the statement of cash flows (4.274) as well as the notes to the financial statements (4.389) were not rated as important as the balance sheet/statement of financial position (4.860) and income statement/ statement of comprehensive income (4.841). The statement of cash flows, statement of changes in equity and the notes to the financial statements were ranked slightly less important than the balance sheet and income statement. These sections also revealed significantly higher standard deviations suggesting variances in opinions concerning the importance of components of SME financial statements other than the balance sheet and the income statement. Secondly, from the perspective of business combinations and related inter-group transactions, the results in Table 2 revealed a mean ranking of between limited and average importance. It is therefore evident that SMEs do not often engage in these types of transactions. Our results suggest that consolidated and separate financial statements (2.866); business combinations and goodwill (2.777); related party disclosures (2.745); investments in joint ventures (2.675); and investments in associates (2.669) are not typical SME transactions as the ranking for all the components was below the centre option (3.000). Our results suggest that the South African SMEs included in our sample do not prepare consolidated financial statements, albeit on a national or international level. This provided support for the statement by Van Mourik (2007:193) that SMEs do not have a global focus. Moreover, our results revealed that South African SMEs do not invest directly in other businesses and that the activities of SMEs are therefore not diverse, but limited to a single product line or business purpose. 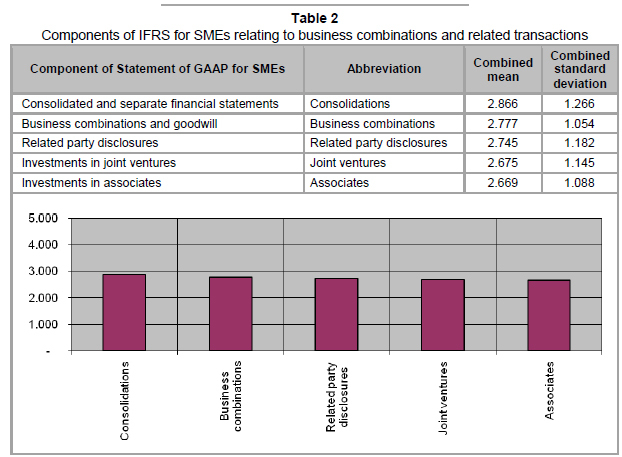 In the third instance we analysed the IFRS for SMEs pertaining to specific types of transactions in Table 3. Our results revealed that guidance in connections with specific transactions were ranked from limited to very important. We noted that financial assets/liabilities (4.287) and property, plant and equipment (4.121) were considered the most important. These two items were considered even more important than income taxes (4.102). accounting policies, estimates and errors (3.573) were ranked tenth while extracting activities (2.210) and service concessions (2.210) were not considered important. Due to different levels of perceived importance of the components as presented in Table 3, we attempted to classify these components into three main categories. These categories were determined based on the mean answer of each component rounded off to the nearest ranking, classified as highly important, moderately important and of less importance in Table 4. 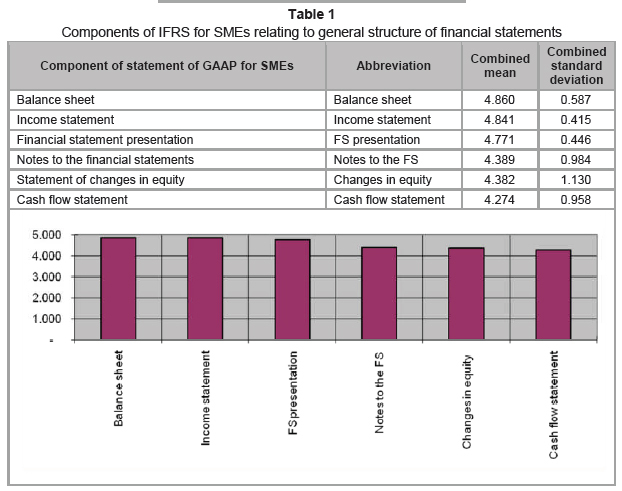 Firstly, the results in Table 1 confirmed the relative importance of the components of the financial statements, as a typical set of financial statements comprise a balance sheet or statement of financial position; income statement or statement of comprehensive income; statement of changes in equity; statement of cash flows; and notes to the financial statements. However, the fact that all the components of the financial statements were not ranked equally might be indicative of the fact that certain components are compiled for purposes of formality only and not necessarily for informational and decision-making purposes. In support of the statement by Sian and Roberts (2009:299) our results also suggest that the balance sheet and income statement is more often used than the statement of cash flows, statement of changes in equity and the notes to the financial statements. Secondly, our analysis in Table 2 suggested that South African SMEs do not engage in investments in subsidiaries, associates or joint ventures. The fact that SMEs in South Africa do not engage in these types of transactions implies that SMEs do not invest directly in other businesses and product lines; and the fact that South African SMEs do not engage in a diverse range of activities might be indicative of exaggerated dependence on a single range of products or activities and vulnerability to specific market risks. 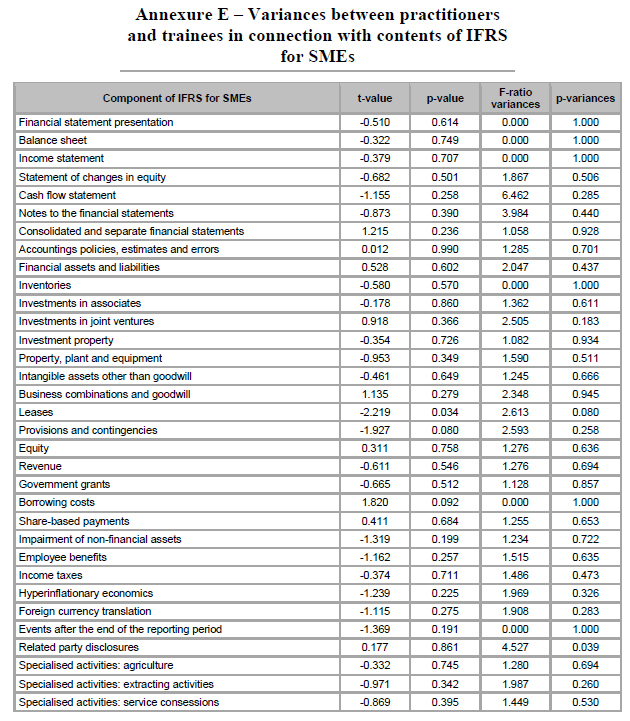 Our analysis in Table 2 also provided support for the OECD in connection with SMEs' involvement in international business. South African SMEs' involvement in investments in subsidiaries, associates and joint ventures, albeit national or international, is limited. The fact that SMEs' shares are not publicly traded implies that international investors are also not investing in South African SMEs. Furthermore, the fact that foreign exchange translation was ranked low in terms of importance confirmed to us that SMEs are mainly involved in economies that are geographically and culturally close. Thirdly, we observed from Table 3 and Table 4 that seven of a total 33 components were rated of moderate importance. Included in this group were provisions as well as impairment of non-financial assets. In the wake of the global financial crisis we believe that these two components should be more important. The results might suggest that accountants do not realise their obligation to account for impairment in values and to account for provisions or that SMEs follow alternative procedures to deal with financial uncertainty. In the fourth place, the components pertaining to specialised activities were ranked of moderate to limited importance. 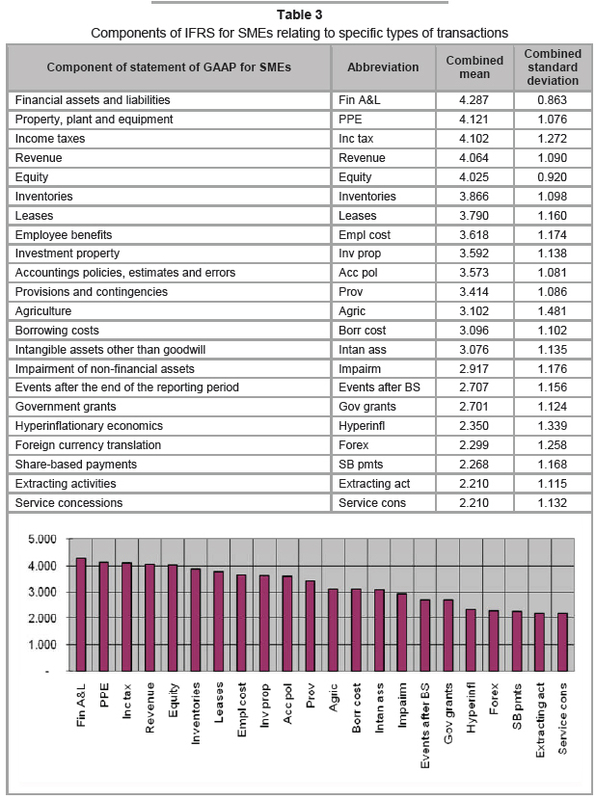 Apart from agriculture, that was ranked moderately important, the remaining two specialised activities, extracting activities and service concessions, were ranked as of limited importance, perhaps indicative of the fact that SMEs in South Africa are involved in different or alternative specialised activities. The fact that a limited importance ranking was obtained for hyperinflation economies might be attributable to the fact that South Africa did not experience hyperinflationary conditions in recent times. 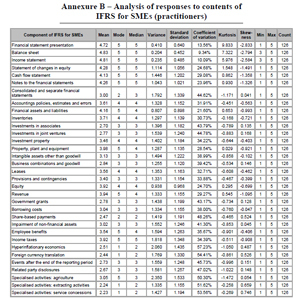 In conclusion, due to the fact that most of the components (70 per cent) were either of high or moderate importance, while only 30 per cent were considered less important, it appears as if the IFRS for SMEs is likely to adequately address the reporting requirements of SMEs in South Africa, therefore our hypothesis is rejected. 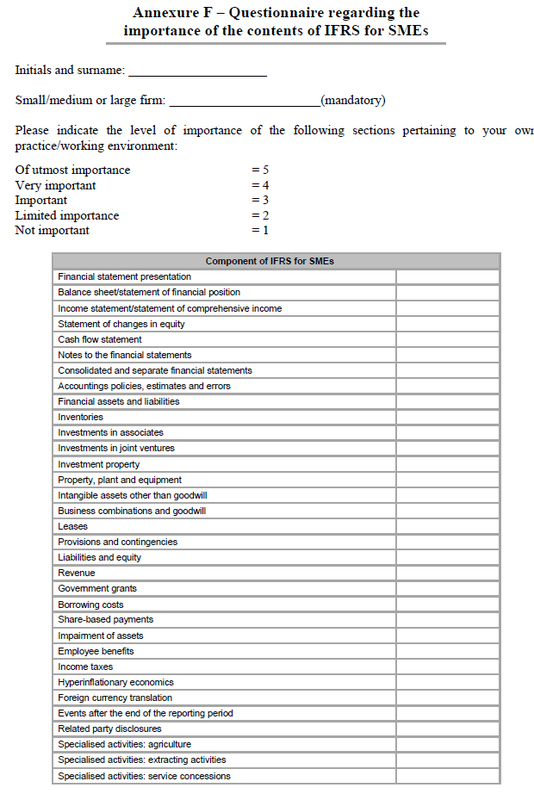 We suggest however that, based on the results in Table 2, the adoption of the IFRS for SMEs will be complicated by the dissonance between a global/international focus and limited involvement in international business by South African SMEs. AMERICAN INSTITUTE OF CERTIFIED PUBLIC ACCOUNTANTS. 2008. IFRS primer for audit committees. [Online] Available at: http://www.macpa.org/content/Public/Documents/PDF/IFRS_audit.pdf [Accessed: 2009-04-27] [ Links ]. ANACORETA, L. & SILVA, P.D. 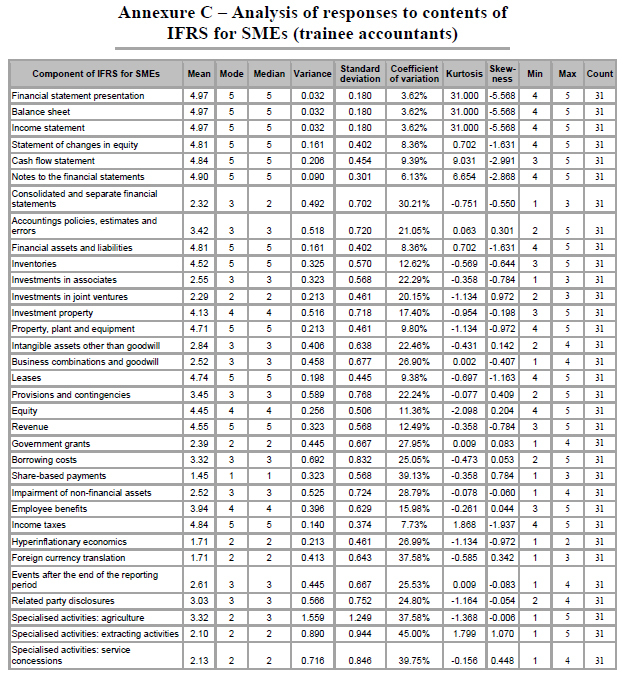 2005. international accounting standards for SME's: an exploratory study. [Online] Available at: http://www.porto.ucp.pt/feg/links/papers/IASB_on_SME_Luisa_ Anacoreta_e_Duarte_Silva.pdf [Accessed 2009-06-06] [ Links ]. ASSOCIATION OF CHARTERED CERTIFIED ACCOUNTANTS. 2000. The economic environment and the SME. Available at: http://www.accaglobal.com/pdfs/smallbusiness/EESME.doc [Online] [Accessed 2009-03-15] [ Links ]. ASSOCIATION OF CHARTERED CERTIFIED ACCOUNTANTS. 2004. Preparing for 2005 - the impact of IFRS on unlisted companies. [Online] Available at: http://www.accaglobal.com/general/activities/library/financial_reporting/ifrs_articles/2792523 [Accessed 2009-07-08] [ Links ]. ASSOCIATION OF FINNISH ACCOUNTING FIRMS. 2007. Comments on the exposure draft IFRS for SMEs. [Online] Available at: http://taloushallintoliitto-fi-bin.directo.fi/@Bin/dbb8cacf837c3b5e15e23250ab1ff523/1242676973/application/pdf/66665/Exposure%20draft%20IFRS%20for%20SMEs.pdf [Accessed 2009-05-15] [ Links ]. CARTE, D. 2007. IFRS Big news, big news! Accounts simplified. [Online] Available at: http://www.moneyweb.co.za/mw/view/mw/en/page90?oid=164049&sn=Detail [Accessed 2009-05-13]. CORDERY, C. J. & BASKERVILLE, R.F. 2006. Small GAAP: a large jump for the IASB. [Online] Available at: http://www.afaanz.org/research/AFAANZ%20069.pdf [Accessed 2009-05-12] [ Links ]. CORREA-CORTES, A. 2008. Smes in developing countries: financial and economic factors that affect export strategies. [Online] Available at: http://www.monografias.com/trabajos69/smes-developing-countries/smes-developing-countries2.shtml [Accessed 2009-10-30] [ Links ]. DEACONU, A., NISTOR, C.S. & POPA, I. 2009. Analysis of the stakeholders' needs and their inference upon financial reports of SMEs. Journal of International Business and Economics. [Online] Available at: http://findarticles.com/p/articles/mi_6775/is_1_9/ai_n36509542/?tag=content;col1 [Accessed 2010-08-11] [ Links ]. DIXON, T., THOMPSON, B. & MCALLISTER, P. 2002. Report for small business service research programme. [Online] Available at: http://www.berr.gov.uk/files/file38315.pdf [Accessed 2009-04-23] [ Links ]. EPSTEIN, B.J. & JERMAKOWICZ, E.K. 2007. International standards for small and medium-sized entities analyzing the IASB exposure draft. [Online] Available at: http://findarticles.com/p/articles/mi_qa5346/is_200710/ai_n21296821/. [Accessed2009-07-08] [ Links ]. EUROPEAN ACCOUNTING ASSOCIATION'S FINANCIAL REPORTING STANDARDS COMMITTEE. 2004. Comment letter SME standards. [Online] Available at: http://www.accademiaaidea.it/downloads/Ias/c16.pdf [Accessed 2009-07-06] [ Links ]. EUROPEAN COMMISSION. 2010. Summary report of the responses received to the commission's consultation on the international financial reporting standard for small and medium-sized entities. [Online] Available at: http://ec.europa.eu/internal_market/accounting/docs/ifrs/2010-05-31_ifrs_sme_consultation_summary_en.pdf [Accessed 2010-08-20] [ Links ]. FINANCIAL EXECUTIVES RESEARCH FOUNDATION. 2006. What do users of private company financial statements want? [Online] Available at: http://www.pcfr.org/downloads/05_07_Meet_Materials/FERF_Private_Co_User_Survey.pdf [Accessed 2009-05-13] [ Links ]. HO, Y. & SHYING, M. 2007. Bridging the GAAP. [Online] Available at: http://www.cpaaustralia.com.au/cps/rde/xchg/cpa/hs.xsl/724_24651_ENA_HTML.htm. [Accessed 2009-05-12] [ Links ]. HONG KONG INSTITUTE OF CERTIFIED PUBLIC ACCOUNTANTS. 2004. HKICPA's Comments on the IASB discussion paper preliminary views on accounting standards for small and medium-sized entities. [Online] Available at: http://www.hkicpa.org.hk/professionaltechnical/accounting/submissions/DP_SME.pdf [Accessed 2009-05-15] [ Links ]. INSTITUTE OF CHARTERED ACCOUNTANTS IN AUSTRALIA. 2007. IFRS for private entities (formerly IFRS for SMEs): ANT chronology. [Online] Available at: http://www.charteredaccountants.com.au/financial_reporting/current_issues/smesprivate_entities/A117036912 [Accessed 2009-05-15] [ Links ]. INSTITUTE OF CHARTERED ACCOUNTANTS OF SCOTLAND. 2008. The implementation of IFRS in the UK, Italy and Ireland. Edinburgh: The Institute of Chartered Accountants of Scotland. [ Links ] INTERNATIONAL ACCOUNTING STANDARDS BOARD. 2007. Exposure draft of a proposed IFRS for small and medium-sized entities. [Online] Available at: https://www.saica.co.za/documents/IFRSStatementofGAAPforSMEs.pdf [Accessed 2008-11-30] [ Links ]. INTERNATIONAL ACCOUNTING STANDARDS BOARD. 2009a. IFRS for SMEs. [Online] Available at: http://www.iasb.org/Current+Projects/IASB+Projects/Small+and+Medium-sized+Entities/Small+and+Medium-sized+Entities.htm [Accessed2009-05-13 May] [ Links ]. INTERNATIONAL ACCOUNTING STANDARDS BOARD. 2009b. 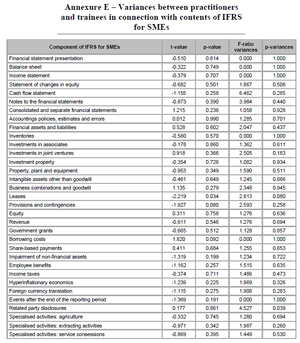 IASB publishes IFRS for SMEs. [Online] Available at: http://www.iasb.org/News/Press+Releases/IASB+publishes+IFRS+for+SMEs.htm [Accessed 2009-10-27] [ Links ]. INTERNATIONAL ACCOUNTING STANDARDS BOARD. 2009c. Basis for conclusions IFRS for SMEs. [Online] Available at: http://www.ifrs.org/IFRS+for+SMEs/IFRS+for+SMEs.htm [Accessed 2010-08-20] [ Links ]. INTERNATIONAL FEDERATION OF ACCOUNTANTS. 2006. Micro-entity financial reporting: perspectives of preparers and users. [Online] Available at: http://www.saipa.co.za/documents/Micro-entity%20Financial%20Reporting-IFAC%20Information%20Paper.pdf [Accessed 2010-08-05] [ Links ]. LOMBARD, A. 2008. Statement of GAAP for SMEs - implementation issues. [Online] Available at:http://www.accountancysa.org.za/documents/ASANovember08pgs14-21.pdf [Accessed 2010-08-05] [ Links ]. RSM INTERNATIONAL. 2008. Exposure draft on IFRS for SMEs: Is this the right answer? [Online] Available at: http://www.rsmi.com/attachments/approved/ifrs-for-smes/en/PaperonIFRSforSMEsFINAL.pdf[ Accessed 2009-07-06] [ Links ]. SARACINA, T.H. 2005. Harmonizing international accounting standards. What does it mean for small and medium enterprises (SME'S)? [Online] Available at: http://www.aibse.org/Proceedings/Proceedings%202005/Harmonizing.doc [Accessed 2009-07-07] [ Links ]. SCHIEBEL, A. 2007. External users of SMEs' financial statements are different! Wild guess or sound empirical analysis? [Online] Available at: http://www.essec-kpmg.net/us/eufin/pdf/papers/Schiebel.pdf [Accessed 2009-05-13] [ Links ]. SCHIEBEL, A. 2008. Is there a solid empirical foundation for the IASB's draft IFRS for SMEs? [Online] Available at: http://papers.ssrn.com/sol3/papers.cfm?abstract_id=994684 [Accessed 2009-05-13] [ Links ]. SIMPSON, S. 2008. Developing countries' views on financial reporting standards for small and medium- scale enterprises (SMEs): The case of Ghana. [Online] Available at: http://papers.ssrn.com/sol3/papers.cfm?abstract_id=1305141 [Accessed 2009-07-06] [ Links ]. SOUTH AFRICAN INSTITUTE OF CHARTERED ACCOUNTANTS. 2007a. ED IFRS for small and medium entities: a summary of the exposure draft. [Online] Available at: https://www.saica.co.za/documents/IFRS_Booklet.pdf [Accessed 2009-05-13] [ Links ]. SOUTH AFRICAN INSTITUTE OF CHARTERED ACCOUNTANTS. 2007b. Exposure draft on international financial reporting standards for small and medium-sized entities. [Online] Available at: http://www.saica.co.za/Default.aspx?tabid=772&def [Accessed 2010-08-05]. SOUTH AFRICAN INSTITUTE OF CHARTERED ACCOUNTANTS. 2008. SA accounting standards poised for Micro-Gaap revolution. [Online] Available at: http://www.saica.co.za/About/Regions/SouthernRegion/SouthernRegionNewsletterAugust2008/SAAccountingStandardspoisedforMicroGaap/tabid/1190/language/en-US/Default.aspx [Accessed 2010-08-05] [ Links ]. SOUTH AFRICAN INSTITUTE OF PROFESSIONAL ACCOUNTANTS. 2009. Financial reporting framework for non public entities. [Online] Available at: http://www.saipa.co.za/DisplayContent.asp?ContentPageID=546 [Accessed 2010-08-05] [ Links ]. UNITED NATIONS. 2008. Accounting and financial reporting guidelines for small and medium-sized enterprises (SMEGA) - Level 3 guidance. [Online] Available at: http://www.unctad.org/en/docs/c2isard50_en.pdf [Accessed 2009-07-06] [ Links ]. WOMPENER, A. & KOHRMANN, H. 2006. The relevance of non-financial value reporting. [Online] Available at: http://www.eaa-online.org/conf2006/downloads/abstract_pdf/FAN.PDF [Accessed 2009-04-16] [ Links ]. ZANZIG, J.S. & FLESHER D.L. 2006. GAAP Requirements for nonpublic companies. [Online] Available at: http://www.nysscpa.org/cpajournal/2006/506/essentials/p40.htm [Accessed 2008-07-15] [ Links ].